The Egyptian temples have a long and well-documented history, covering a time span of nearly five thousand years. An attempt has been made (in earlier work by the author) to regard the Egyptian cultural history as a unity in time and place. If such a unity exists – as an assumption – it is possible to relate to and communicate with this historic entity in a quadralectic way. The theoretical approach of this method is given in Chapter 7. For the moment, it will be sufficient to know that two boundaries (visibility dates) are necessary to draw a communication graph (CF-graph). This CF-graph is the general expression of every interaction between the observer and the observed that takes place in a communication ruled by the four-division. The communication factor (CF) is a measure of the shift between the four-divisions of the communication partners and subsequently, a valuation of visibility. Certain points of recognition (POR), which are established in a process of analogy, determine the position in the communication. The ‘beginning’ of empirical ‘visibility’ (from the Western perspective) was placed around 3100 BC and the ‘end’ at 500 BC. These dates do not mean that before or after these boundaries Egypt did not exist, but only that its cultural existence was less prominent and widespread from the present point of view. With these two markers, it is possible to draw the CF-graph for the Egyptian cultural history (fig. 58). Fig. 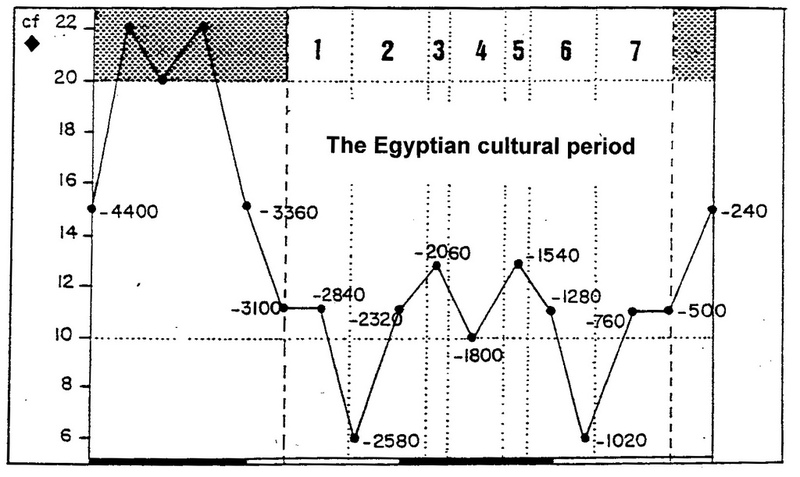 58 – The Egyptian cultural period is given here as a CF-graph. The abbreviation CF (the communication factor) indicates a mental distance between the observer and the observed. The (visible) visibility period (X) is situated between 3100 and 500 BC. The whole cycle (V) runs from 4400 BC to 240 BC. The division in seven time units (1 – 7) point to the main characterizations of the Egyptian history as given in the existing literature: 1. Archaic Period; 2. Old Kingdom; 3. First Intermediary Period; 4. Middle Kingdom; 5. Second Intermediary Period; 6. New Kingdom; 7. Third Intermediary Period and/or Late Period. The architectural narrative of temples is a reflection of the different types of worships, which run through time and place. Several major beliefs can be noted in the long Egyptian history. The temples of the various faiths have their own characteristics, which reflect their division background. The major currents will be honored here and a brief reference to a possible four-fold connection will be given. 1. The Ogdade of Hermopolis is concentrated around the city of Hermopolis (Shmun or Khmunu) in Middle Egypt. The old Egyptian name of Shmun is a reference to the number eight. The main deity is the god Thoth, figured as an ibis or as a baboon. Thoth was the inventor of writing, teacher of man, mediator and the messenger of the god. The Greek drew, for this very reason, a comparison with their own god Hermes and hence the name of the place as Hermopolis (the city of Hermes). The ruins close to Hermopolis were dated from the Middle and New Kingdom. Ramses II built a temple here with materials from the abandoned city of Akhetaten. The Corinthian capitals and columns, which are still standing at Hermopolis Magna, are from a Christian basilica constructed on the site of a third century Ptolemaic temple. There are also statues of two large baboons, which probably guarded the entrance to the Temple of Thoth. A quadralectic interpretation would place Thoth (Hermes) – being the wisest god associated with speech, literature, arts, learning and the measurement of time (calendar) – in the Fourth Quadrant. ‘The Reckoner of Times and of Seasons’ and the one who balances is a ‘God of the Equilibrium’. This ‘Master of the Balance’ is, in turn, associated with the four-division. The male gods were depicted with frog heads, while the goddesses were shown with the heads of serpents. The Ogdoad ruled the world during a Golden Age, then they died and went to the Duat or Underworld. They became responsible for the rising of the sun everyday and brought forth the lotus that held the sun god. The city of Hermopolis is associated with four different stories of the Creation. The acknowledgement of the importance of a ‘beginning’ is typical in a process of growing awareness of existence. The number of creation stories might not be a pure coincidence, but could reflect genuine higher division thinking. The first presumption made a reference to a cosmic egg that was laid by a celestial goose on the primeval mound. The egg contained Re, the bird of light, who then created the world. Remains of the great egg were shown to pilgrims to Hermopolis. The second creation story told of an egg laid by an ibis, the bird of Thoth. This version might be created by the priests of Thoth to merge the mythologies of the Eight and of Thoth. The third account says that a lotus flower emerged from the waters of a lake called ‘the Sea of the Two Knives’. When the lotus’ petals opened the divine child Re was revealed. Finally, the last story is similar to the third account, but now a scarab beetle, as a symbol of the rising sun, leaves the lotus. The scarab is transformed into a crying boy and his tears became mankind. The lotus was sometimes identified with the Eye of Re. It is possible, that these four creation stories were – in themselves – part of a tetradic world outlook (although this interpretation has never, as far as I know, been suggested). The four stories represent in that situation an equal number of viewpoints (comparable to the modern four ‘quadrants’). The cosmic egg is a reminder of the unity of the First Quadrant (the primeval mound where the sun was born). The introduction of the ibis, as the bird of Thoth, brought a connection with the mythology of the Eight (Ogdoad) and is, at the same time, a reference to the (double) four-division. This type of partition-consciousness in general is characteristic of the definition of a ‘first division’ in the (quadralectic) Second Quadrant. The third creation story, with the lotus emerging from the ‘Sea of the Two Knives’ and the dedication to Re (the god of the day in contrast to the dog-headed baboon as an animal of the night) can be interpreted as a Third Quadrant setting. The emphasis on oppositional entities (like good and evil (the two knives) or night and day will lead to a clear view of the present. Problems start when the consciousness of visible visibility becomes overwhelming. The use of a knife as a symbol of protection and retribution will not be sufficient to survive the world of the material existence. The final story referred to the scarab beetle (kheper). This particular species of beetle (Scarabaeus sacer) has the habit of rolling balls of dung in which the female would lay her eggs. Amulets and stamp seals were often depicted with the scarab beetle, in particular from the New Kingdom onwards. During that time, the scarab amulets were placed over the heart of the mummified deceased in order to assist in the final judgement. Its symbolic value was derived from nature (young beetles emerging from a hole) and related to the scarab-beetle god Khepera, meaning ‘he was coming forth’. Khepera is a form of the sun god Re and specifically the god of the rising sun. Khepera would roll the sun along the sky in the same way as the dung beetle rolls the ball of dung. A modern interpretation (of the fourth creation story) could be stated as follows. The visible visibility (of the Third Quadrant) – including the dung! – is pushed into the visible invisibility (of the Fourth Quadrant) or even further into the invisible invisibility (of the First Quadrant). This transfer brings brightness into the communication and can be weighted against the feather of truth during the final judgement. Self-generation and self-renewal are the hallmarks in this particular stage of the communication. The possibility that the different creation stories represent various aspects of the same ‘beginning’ only placed in a different mental division-environment is, to say the least, a challenging prospect. To ‘prove’ the historical setting of these four stories and their internal coherence in a scientific context is a different matter. Could it ever be done? The first stipulation for modern science will be to leave the rigid bounds of oppositional thinking and place its findings in a wider field of visibility. 2. The Enneade of Heliopolis is the name for the nine gods making up the cosmogony (creation story) of the city of Heliopolis. The city is situated north of Cairo in the Nile delta. The world started, in the view of the Heliopolians, as chaos from the primeval water (‘Nun’). Atum (Re) was the first, single god to rise from this water and formed a hill (which was the founding place of Heliopolis, symbolized by the stone Benben. Atum created from his shadow his children Sjoe (Schu) and Tefnoet (Tefnut), respectively the god of the air and humidity/water. This first pair of ‘conceptual’ gods brought into being another pair named Noet (Nut) and Geb, representing heaven and earth. The four children of Noet and Geb were called Nephtys, Seth, Isis and Osiris. This four-some became, in later times, the inspiration for a number of legends, with Osiris, Horus, Hathor and Anubis as major players. One singularity, two pairs and four children completed the nine-some (ennead) of Heliopolis. The general impression of the creation story is a preference for the number nine, which is outside practical division thinking. However, they can also be arranged in a particular sequence, following the (quadralectic) quadrants (fig. 59). Fig. 59 – The Enneade of Heliopolis is placed here in a quadralectic setting according to the prominence in their creation history. The god Atum embodied the All, the Supreme Being or the sun god as a monad. It gave the energy to start life. His position fits in the First Quadrant. Everything is in everything in this locality of invisible invisibility. The first pair (Sjoe and Tefnoet) represented the first division in a state of invisible visibility. They represent the forces of life and the need for order. Their co-operation is placed here in the Second Quadrant. The second pair (Noet and Geb) is a true duality. Geb is a god of the earth, personified the land of Egypt. His wife Noet, after giving four children to Geb, was separated from Noet by Sjoe – on the orders of Atoem – to become the god of heavens. The division between heaven and earth (god and human) – interpreted here as the genesis of oppositional thinking – has its place in the Third Quadrant. 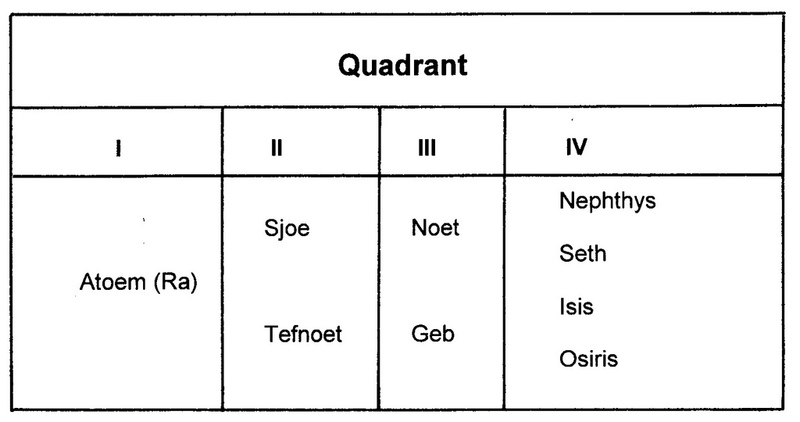 Finally, the four children of Geb and Noet represent the multiplicity of the Fourth Quadrant. Nephthys was the wife of Seth. Seth was a reminder of the chaos. Isis was the wife of Osiris, who gave birth to Horus, god of the heavens. Osiris was the king of the afterworld. 3. The gods of Memphis were worshiped in the city with the same name, located on the western side of the Nile, south of the modern city of Cairo. The Memphis cosmogony was probably more than the other previous beliefs, based on the rational and human aspects of the gods and creation. Although the essential characteristics of the gods were as old as the Early Dynastic Period its full appreciation only came in the Nineteenth Dynasty (1307 – 1196 BC), when the creativity and internationalization of the New Kingdom urged for a realistic theology. The major god was Ptah, the craft god and protector of artisans and artists. He was a worker in metal and sculptor of the gods. Ptah used his heart and tongue to create the universe. The theology of Ptah aimed at a synthesis of the mind and the material world. Sekhmet, the lioness goddess of war and battle, consorted with the god Ptah. The couple had a son called Nefertum, meaning ‘Tem (Atum) the Younger’. He was often portrayed as a man holding the khepesh (curved sabre) or the ankh (symbol of life). Nefertum was replaced, in later times, by Imhotep, a godly human and builder of the first step pyramid of Zoser (2630 BC) and ‘inventor of building in stone’. The act of building became an object of worship (of the visible) in the later stages of the Egyptian cultural history. The Shabaka Stone was presented to the British Museum in 1805, after it was used for many years as a millstone by farmers. It was named after the black Nubian pharaoh Shabaka, who lived in the XXVth Dynasty (716 – 702 BC). The inscriptions proved a great source of information about the political situation and theological priorities from a l perspective in Egyptian history. The source claimed to be a copy of an ancient document and could have been an adaptation from older texts. A quadralectic context for the Memphite cosmogony is more difficult to establish since a four-fold narrative is missing. Therefore, fig. 60 gives a tentative view of the Memphite pantheon. Horus remained in the background and is situated in the First Quadrant. The four sons of Horus occupy the Second Quadrant, as a four-division. The couple Ptah and Sechmet claimed the Third Quadrant. 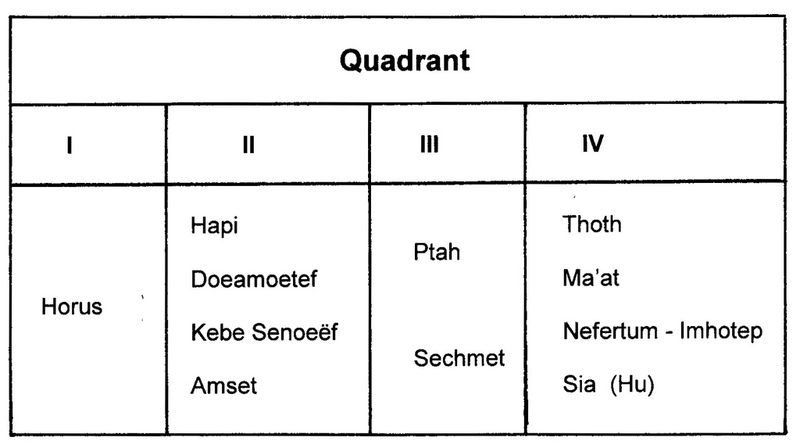 The god Thoth (with a dedication to learning and wisdom), Ma’at (cosmic harmony), Imhotep (building) and Sia (feeling) give a ‘quadralectic’ division of the Fourth Quadrant. Fig. 60 – A diagram of the gods of Memphis situated in a proposed quadralectic framework. The emphasis of worship (in the New Kingdom) is focused on the god Ptah. This four-division reflected the stages in an act of worship and can be interpreted as different positions in relation to the godhead or pharaoh and, ultimately, to a reflection of life-itself (fig. 61). Fig. 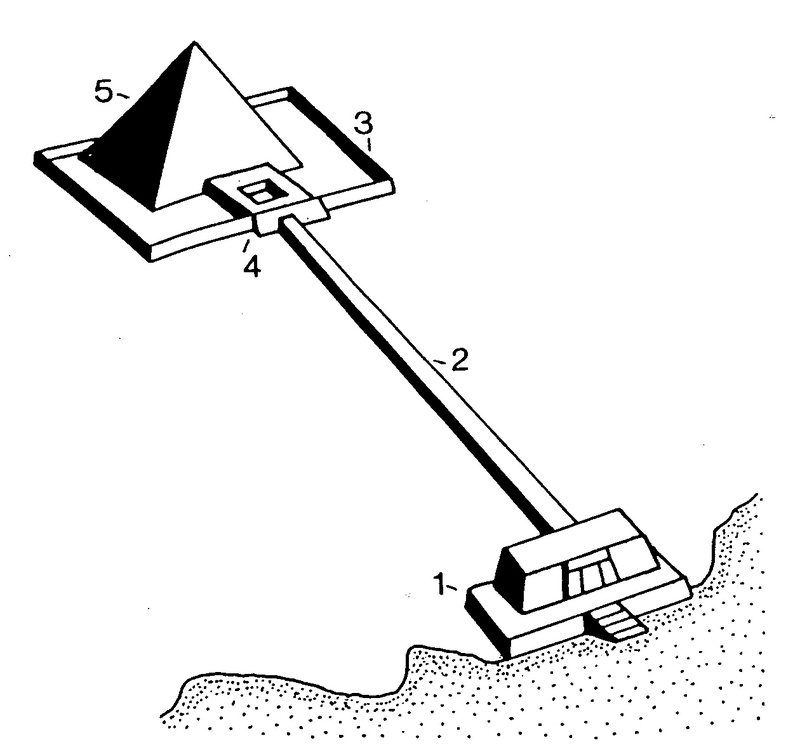 61 – A well developed pyramid complex of the Old Kingdom consisted of four main architectural components. These separate structures had a symbolic meaning as a representation of life (and death): 1. The valley temple; 2. The causeway; 3. The mortuary or pyramid temple; 5. The pyramid containing the body of the king-pharaoh (after MARTIN, 1991). The temples of the Old Kingdom (2686 – 2160 BC) came into being when the Egyptians activated a higher division scheme and used its richness of possibilities. No history writing took place in the first part of this stage. Tombs contained biographical texts from the later part of the Old Kingdom and gave the achievements of the deceased. Egyptians counted the years of each king’s reign, but started again with counting when a new king came to the throne. The Pyramid texts, written inside the pyramids, only started from the reign of King Unas around 2350 BC, at the end of the Fifth Dynasty. The Old Kingdom, with a special significance from the Fourth to the end of the Sixth Dynasty, provided the style and canon of Egyptian art and architecture. The first true pyramids appeared in the Fourth Dynasty (2613 – 2494 BC), evolving from the step pyramids of the Third Dynasty (2686 – 2613 BC). The most famous pyramid complex at Gizeh was built by the kings Khufu (Cheops), Khafre (or Chefren to the ancient Greeks) and Menkaure (Mycerinos). The architectural program found its inspiration in a funerary culture, in which the afterlife was of equal importance as the present day life. The consciousness of the presence as a continuous observation through time and the importance of a tension between the various stages of visibility are very much akin to the quadralectic outlook. The four-fold scheme of the various architectural components is clearly visible in most pyramid complexes. A good example is the pyramid of Pepi II, a pharaoh of the Sixth Dynasty and the last significant ruler of the Old Kingdom (fig. 62). He must have reigned for nearly a century (94 years) after he came to the throne at the age of six (2278 – 2184 BC). Fig. 62 – The pyramid complex of Pepi II in South Saqqara shows the main four-fold division, with a special prominence of the pyramid temple. One part of the funerary temple (the offering hall) is inside the pyramid enclosure, while the other part (with open courtyard) is outside the perimeter. Originally, the courtyard had eighteen pillars of reddish quartzite. The queen’s pyramids surround the main pyramid. Most famous of all pyramid and temple complexes is the necropolis of Gizeh, just outside Cairo (fig. 63). The four construction elements, con-sisting of a pyramid of the king with a mortuary temple in front, followed by a causeway leading towards a valley temple (along the river Nile), are repeated here in three-fold. The pyramid, as the most visible element of the quaternary, is also the most secretive place. The pharaoh was buried deep in the pyramid and nobody was allowed to enter the chambers after the burial. A large wall was intended to keep the common people out. Fig. 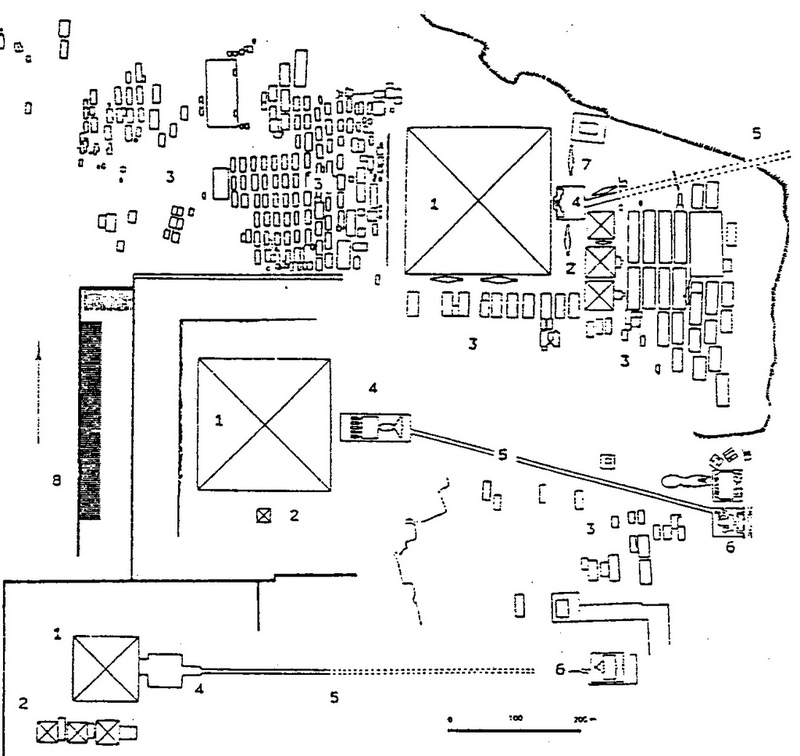 63 – A map of the necropolis of Gizeh (Cairo, Egypt) with the three major pyramids of the Old Kingdom (1): Khufu, Khafre and Menkaure. The mortuary temples (4) are connected by causeways (5) to the valley temples (6). This four-fold scheme of building elements was established at the earliest beginning of pyramid building and might have been a reference to a tetradic way of thinking. The pyramid represents – in a quadralectic reconstruction – the First Quadrant, the mortuary temple the Second Quadrant, the causeway, the Third Quadrant and the valley temple the Fourth Quadrant. Fig. 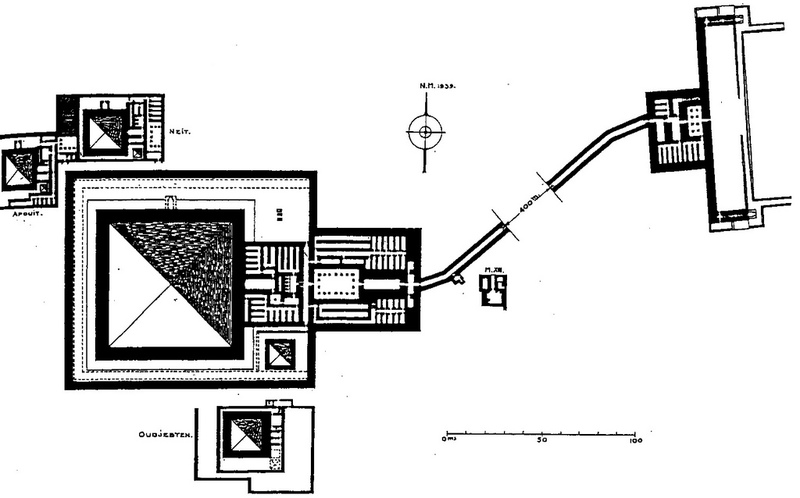 64 gives a plan of the mortuary temple of the pyramid of Khufu (the Great Pyramid). The temple is situated on the east side of the pyramid and a limestone pavement separates the two architectural elements. Three boat pits flank the temple to the north, east and south side. The temple has a distinct bilateral symmetry along an east-west axis. Thirty-eight pillars (a rectangle of 7 x 14 pillars) line the inner court, with an additional twelve are added on the western side. No obvious numerological four-fold reference can be found here. Fig. 64 – A plan of the Mortuary Temple of the Pyramid of Khufu (or the Great Pyramid) in Gizeh indicate a symmetry (in plan) along an east-west axis of the main structural feature. The number of pillars (fifty) or its distribution (7 x 14) do not have a reference to a tetradic context. All the options are still open for this (second) stage of the communication, but there is a hind towards the necessity of a (two-fold) division in order to translate the presence of the invisible invisibility (the godhead/pharaoh) into the realm of the (human) visible. The mortuary temple and the holy and sacred sacraments performed therein in ancient times might hold the key to that visibility. The valley (lower) temple of the Khafre (or Chephren) pyramid complex in Gizeh (fig. 65 left) belonged to the people. It might have been more accessible than the holy structures further up the causeway, including the mortuary temple and the pyramid. Four colossal sphinxes flank the entrances of the valley temple. The sphinx is a creature with a human head and a lion’s body. It acts as a protective deity. There were twenty-three almost life-size statues of the king in the temple. In the Sphinx temple, next to the valley temple, there were ten larger statues of Khafre. The largest statue of his reign is the Great Sphinx, a feature, which still impresses and puzzles the modern visitors. The Great Sphinx faces the rising sun, its body is sixty meters long and twenty meters high. The face is four meters wide and its eyes are two meters high. Later (smaller) sphinxes were often installed as pairs to guard the entrances of temples and holy places. Fig. 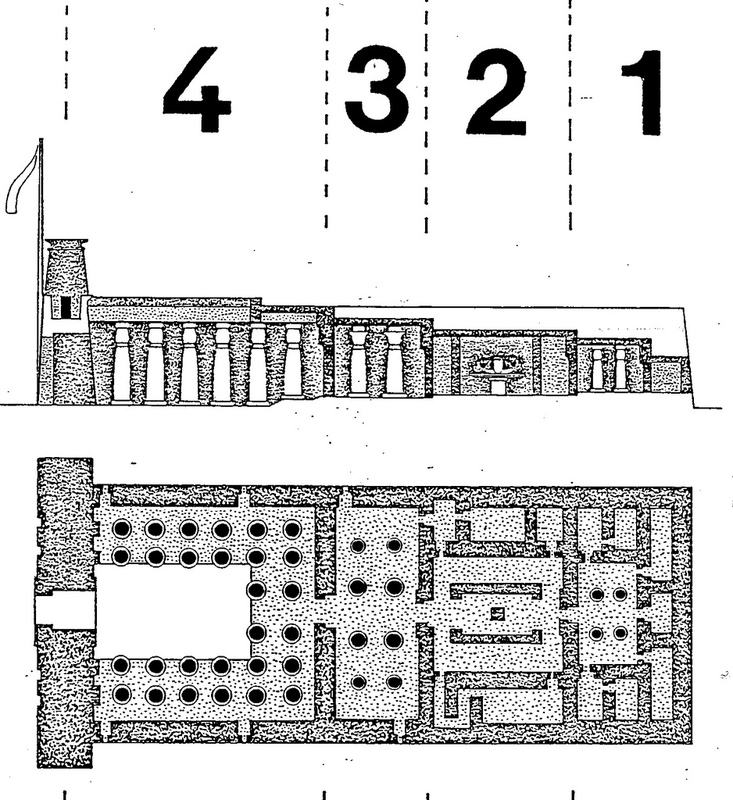 65 – A plan of the Valley Temple (left) and Mortuary Temple (right) of the Second Pyramid in Gizeh showed the symmetrical outlay of the buildings. Pharaoh Khafre, son of Khufu, built the pyramid and temples. The mortuary temple (fig. 65 right) lacks the relative ‘openness’ of the valley temple and is a more ‘secret’ affair, at least from the point of view of the masses. The building has a bilateral symmetry along an east-west axis and is even more enclosed than the mortuary temple of Khufu. Six pillars in a north-south direction and two rows of five pillars in an east-west direction do not indicate any preference for the number four (or it must be the total of sixteen, but that seems to be far fetched). Menkaure (Mycerinos) was the successor of Khafre. He also had his pyramid complex filled with his statutes, often in the company with the goddess Hathor and a nome-deity. These triads could also be interpreted as Horus (the king), Hathor (daughter and wife of Re) and the sun god Re. 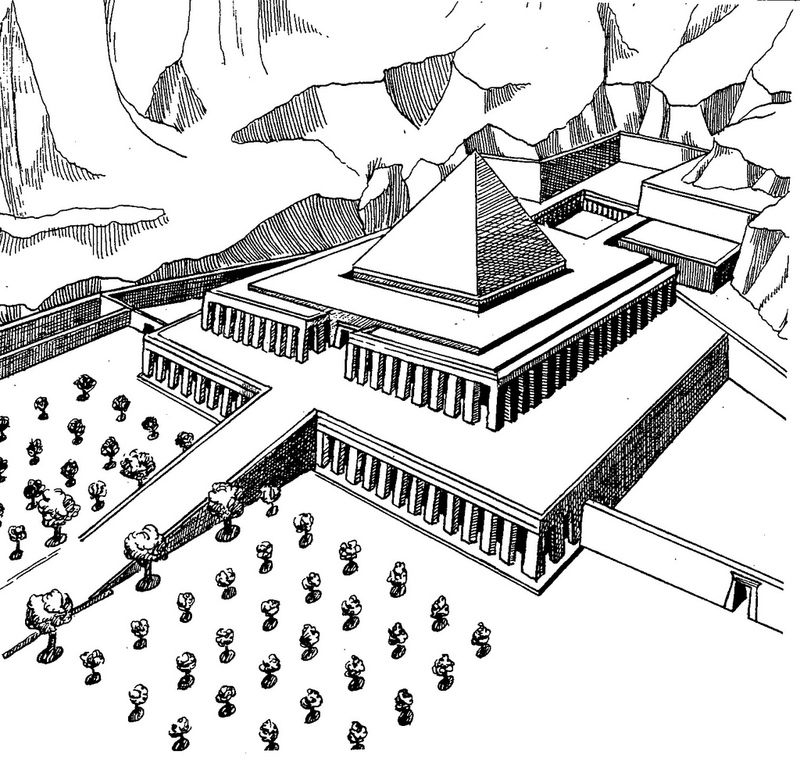 The valley temple of Menkaure (fig. 66) followed the general plan of the lower temples with a bilateral symmetry long an east-west axis and a relative large inner court. Fig. 66 – A plan of the valley temple of the pyramid of Menkaure (Mycerinos), the Third of the large pyramids at Gizeh. The compact plan has an (irregular) east-west symmetry axis, but has hardly any tetradic features. The conclusion of this small overview of early mortuary and valley temples points to a bilateral symmetrical axis – and therefore to a two-fold division. The compartments nor the number of pillars or other features do have a tetradic reference. It seemed, that the architects of temples of the Old Kingdom were not primary concerned to express the same kind of ‘four-foldness’ in their temples as they did in the building of the funeray pyramid-buildings themselves. The distribution of the various courts and buildings along the central axis offers a number element to the temple complex. The sequence of elements did not play an important role in the older temples, as can be noted in the previous examples. It gained importance as the character of (mortuary) temples changed over the long period of the Egyptian cultural prominence. The fore court (IV), the inner court or pronaos (III), the inner temple or naos (II) and the holy place I (adyton) represented a new ‘four-foldness’. Mentuhotep II Nebhepetre (c. 2040 – 2010) was a pharaoh of the Eleventh Dynasty (Middle Kingdom), who established a centralized monarchy. He ruled Egypt for about thirty-nine years and became known as the ‘Uniter of the Two Lands’. The emphasis on the two-fold aspect and the material might be typical for this period in the Egyptian cultural period. Peace and prosperity settled over Egypt and the architectural achievement of his mortuary complex pointed to a new phase in building (fig. 67). Fig. 67 – A reconstruction of the temple-pyramid of pharaoh Nebhepetre-Mentuhotep in Deir el Bahari. Mentuhotep II was an important ruler of the 11th Dynasty (Middle Kingdom). He could unite Egypt and his reign was a time of stability and renewal. The precision (of the Old Kingdom) was gone, but a realistic dedication to worship and building came in its place. 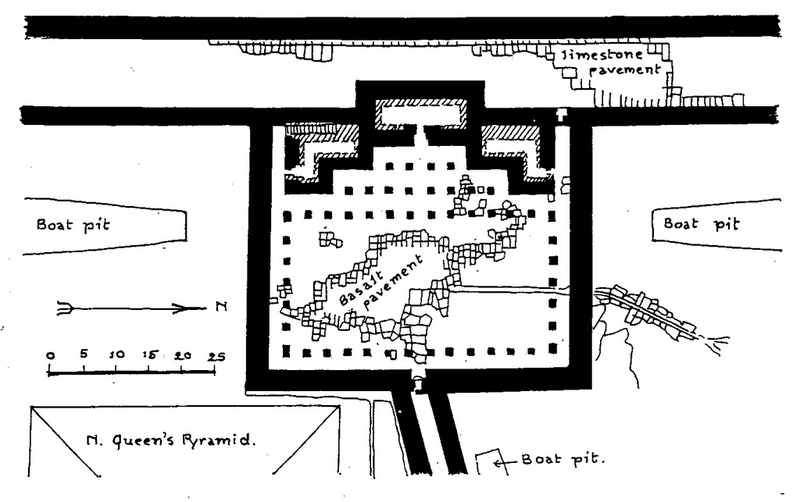 The temple-pyramid at Deir el-Bahari was a combination of a cult structure and a tomb. The temple is smaller and not so well preserved as the nearby temple of Hatshepsut, but acted as a source of inspiration. The magnificent diorite statue of King Mentuhotep II Nebhepetre was found by Howard Carter and is now in the museum in Cairo. The Middle Kingdom experienced brisk economic activity, with an emphasis on the reality of day-to-day life (GRAJETZKI, 2006). A relative short time consciousness, which is typical for lower division thinking, was reflected in the classical literature and poetry. The spirit of ‘carpe diem’ filled the air. The Twelfth Dynasty, with rulers such as Amenemhet I and Seostris I, had an expansive character and foreigners mingled with the original population. Movements of people started in the Middle East towards 1800 BC. Egypt was confronted with the expansionism of other people (Hyksos) and found itself threatened in its identity in the Second Intermediate Period. The New Kingdom, lasting from about 1500 to 1000 BC, was the apogee of the Egyptian culture in terms of visibility (from the present point of view). The temple complex at Karnak (Luxor) is probably the biggest temple complex in the world, but is only a small part of the remains of that period. Pharaoh Thutmozes I followed an aggressive foreign policy, leading to further prosperity at home. Hatsjepsoet, the widow of Thutmoses II, became the regentess of Thutmozes III. Further riches were found in the gold of Nubia and Egypt grew to the most powerful nation of the eastern Mediterranean. The reign of Toetanchamon, although of short duration (1347 – 1337 BC) was important for the modern, ‘Western’ visibility with regards to the Egyptian cultural period. The finding of his burial place and the accompanying treasures sparked a renewed interest in the Egyptian culture in the first quarter of the twentieth century. An increased self-consciousness of the Egyptians of the New Kingdom was part of an increased (material) visibility, as symbolized by the ruling of the Ramsesses, successful rulers of the thirteenth and twelfth century BC. The attention to numbers (and division-in-general) was part of this process. The architectural scheme of the temple might reflect that interest. The ‘old’ four-fold division in architectural elements was now brought together in the temple itself. For instance, the temple of Chon (Khonsu) at Thebe (Luxor) expresses a tetradic division (fig. 68). Fig. 68 – The temple of Chon at Thebe (Luxor) is part of an enormous temple complex consisting of the Temple of Amun, the Temple of Ptah and the Sacred Lake. The old four-fold approach to the godhead (pharaoh) in four types of buildings (temples) is now incorporated in one building. The prominence and the perfection of the pyramids waned (mainly after the New Kingdom) and the building of temples grew in importance. The shift towards a greater division of architectural elements within the temple complexes seemed to continue in time. 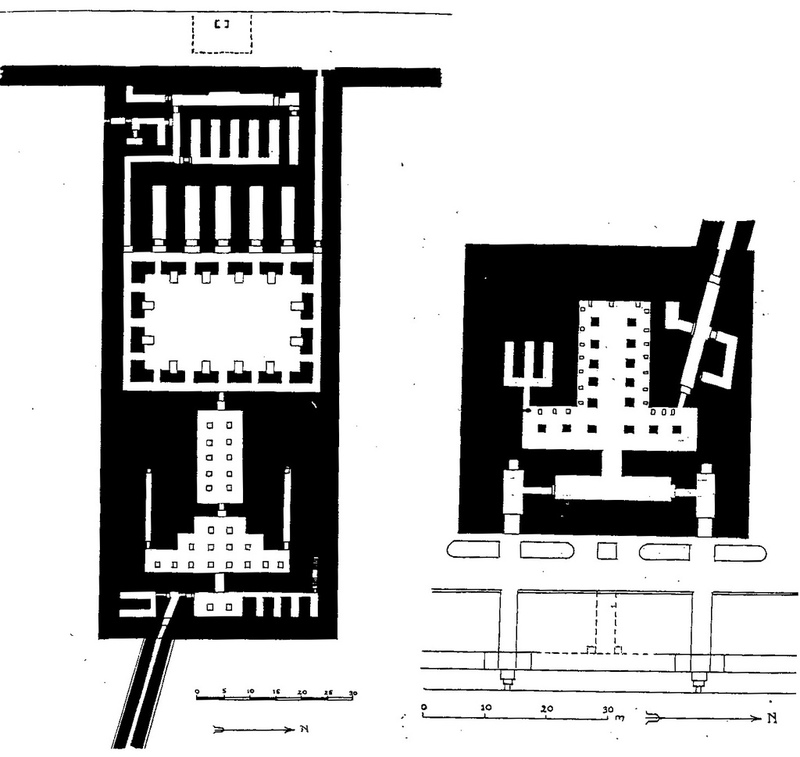 Antoine-Chrysotome Quatremère de Quincy, an influential French architectural theorist (1755 – 1849), gave a plan of various temples with multi-partitioning along the central axis (fig. 69). His examples seem to date from the later part of the Egyptian cultural period. It is known that a succession of pharaohs in the New Kingdom was involved in the building of a complex like Karnak (Luxor). The original scheme lost its significance if various extensions were added, like in the mighty Temple of Amun. It might well be that the Temple of Chon (Khonsu) was ‘arrested’ in its present tetradic state and would have lost this character if time of building had continued. The further division of segments along the symmetry axis, with special emphasis on the addition of pylons as the symbols of dualism, pushed the four-fold scheme to the background. Fig. 69 – These lateral views and plans of two Egyptian temples exhibit the multiple division of architectural elements along a central axis. The bilateral symmetry and division of pylons, pillars and halls was noted by the French architect Antoine-Chrysotome Quatremère de Quincy (1755 – 1849) and published by Pococke in 1803. The attention of these early pioneers to ‘ aspects in the Egyptian temple buildings fitted in the spirit of the times. The cultural entity of Europe was ready, around 1800, to absorb the tetradic spirit again. The idea of the four units along the central axis was exerted in the Horus (Hathor) temple of Edfu, hundred kilometers south of Luxor. This temple, in excellent condition, is dated from the Ptolemean times. During this period, which lasted from 305 – 30 BC, Egypt had lost its independence. The temples are therefore situated outside the visibility period (X) of the Egyptian cultural era sensu stricto (see also p. 87). 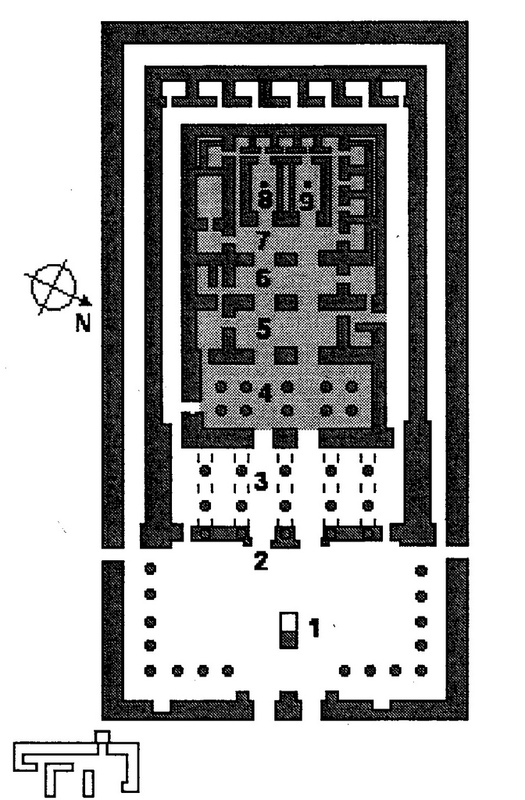 The sub-division of the holy segments of the Edfu temple can be described in quadralectic terms (fig. 70). The fore court remained the largest area (Fourth Quadrant), followed by the hypostyle hall (Third Quadrant) and the Hall of Emanation (Second Quadrant). The First Quadrant is divided in an offer hall, hall of the Enneade and the holy place (adyton). Fig. 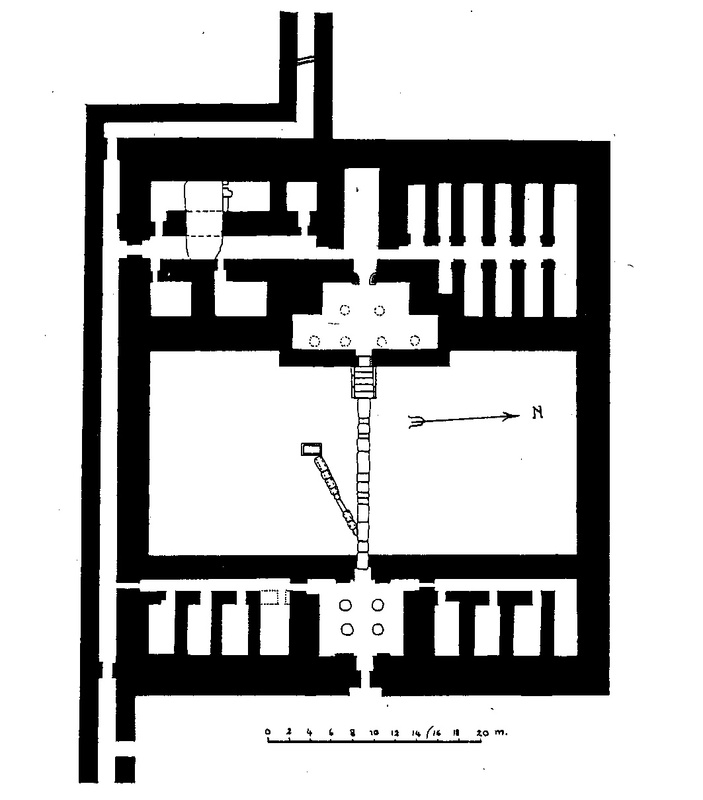 70 – A plan of the temple at Edfu. The temple was built towards the end of the Egyptian visibility period and reflects a strong devotion towards symmetry and the primary geometrical form. Two pylons (P) shape the entrance to the large fore court (H) with a symmetrical pattern of (12 + 4) x 2 = 32 pillars lining the area. 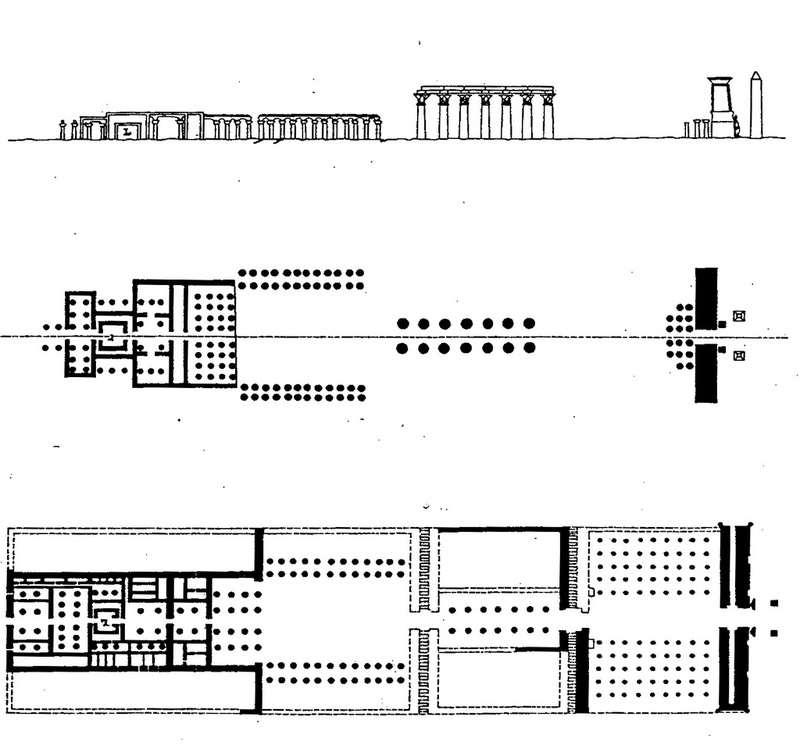 The pronaos or hypostyle hall (1) has a morning house (a) and a library (b). 6 x 2 = 12 pillars support the roof. The hall of manifestation (2) also has 6 x 2 = 12 pillars. The offering hall (3) has no pillars and is fairly small. The hall of the Enneade or middle hall (4) is lined with chapels (4 x 2 + 3). The holy place or adyton (5) with naos (inner temple) contained the holy boat. The temple in Edfu started under the reign of Ptolemy III Euergetes I (246 – 221 BC) and was inaugurated by Ptolemy VIII Euergetes II in 142 BC. Later additions, like the Pronaos (140 – 124 BC), the pillars’ hall and the pylon (116 – 71 BC) took place after the inauguration (ARNOLD, 2000). Some fifty kilometers north of Aswan is the temple of Kom Ombo on the east bank of the Nile, also dating from Ptolemean times (although a temple built in the times of Thutmoses III (1479 – 1425 BC) might have occupied the place earlier). The temple is dedicated to the crocodile god Sobek and the falcon god Haroeris (Horus the Elder). 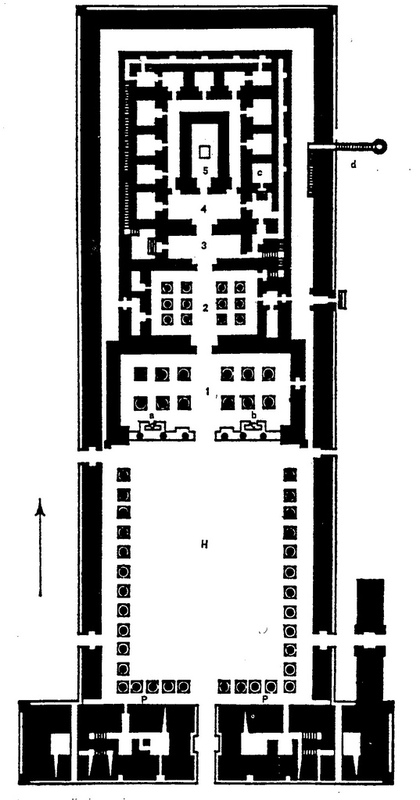 The building actually consists of two temples with the individual elements duplicated along the main central axis (fig. 71). Fig. 71 – The temple of Sobek at Kom Ombo (Upper Egypt) was con-structed in the period between 180 and 30 BC and shows an extended four-division of the basic elements and a double setting along a central symmetry axis. 1. The forecourt; 2. Facade of the pronaos; 3. Pronaos and first hall of hypostyles; 4. Second hall of hypostyles; 5 – 7 vestibules; 8. Sanctuary of the Triad of Horus; 9. Sanctuary of the Triad of Sobek (by Francesco L. Nera). The Temple of Kom Ombol had two entrances, two courts, two colonnades, two hypostyles and two sanctuaries. The hypostyle hall featured papyrus capitals on the columns, which are well preserved. The Four Winds are pictured as godheads on a wall decoration (GUTBUG, 1977), pointing to a continuation of the tetradic tradition. The prominence of the four-fold seemed to gain momentum at the end of the visibility period of the Egyptian culture. It is hard to prove an actual increase of prominence since little or no research is done in this field. The cult of the four-headed ram, which had already figured in the New Kingdom (1554 – 1092 BC), was reintroduced in the Late and Ptolemaic times. Adolphe GUTBUG (1977, p. 241) noted that ‘the concept of the four winds and its rulers in Egypt is very old, it is only in the latest period from the second century BC until the second century AD that the four winds are depicted as theriomorph or mix beings. Until now eighteen occurrences are known’. He gave a picture of the sun god with four ram heads in the sanctuary of Amenophis III at Luxor, created in the New Kingdom (1554 – 1092 BC) and a Phoenician amulet from the eighth century BC. A striking illustration of the god Amun-Re with four ram-heads can be seen in the temple at Esnah (Iunyt; Upper Egypt). The temple is of Ptolemean age. The spirit of the four directions became widely known, because it was depicted by Jean-François Champollion (1790 – 1832) in his ‘Pantheon egyptien’ (1823 – 1831). 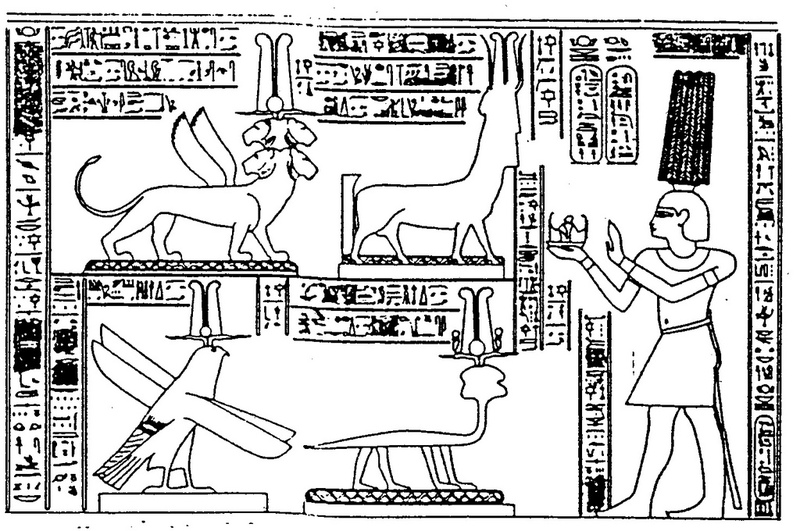 The four winds as an animal with lion heads are also given in a temple in Dendera, dating from the times of Ptomemy XII Neos Dionysos (80 – 51 BC) (fig. 72). Fig. 72 – The Four Winds are expressed as an animal with lion heads. This wall decoration in Dendera marks the beast as part of a quartet of four symbolizations, which might also have a reference to the four-fold. The illustration dates from the Ptolemaic period. The Ptolemaic kings had come to power after the conquest of Egypt by Alexander the Great in 332 BC. The holy cities of Heliopolis, Mendes, Sais and Buto (Boeto) became part of a geographical four-fold symbolism in the closing stages of the Egyptian cultural history (the Late Period, 713 – 323 BC). These demographic centres had a long history of religious pilgrimages (and probably four-fold symbolism), because the pharaoh had to make – after his departure of life – a journey along the four holy cities of the delta. The principal halts on the way to eternal rest corresponded with the cardinal points. These directional stations were, in turn, related to the four elements (fig. 73). Fig. 73 – The four holy cities in Northern Egypt were instrumental in the funerary practices of the Egyptian cultural history. Their symbolism can be seen as a tribute to a form of division thinking. 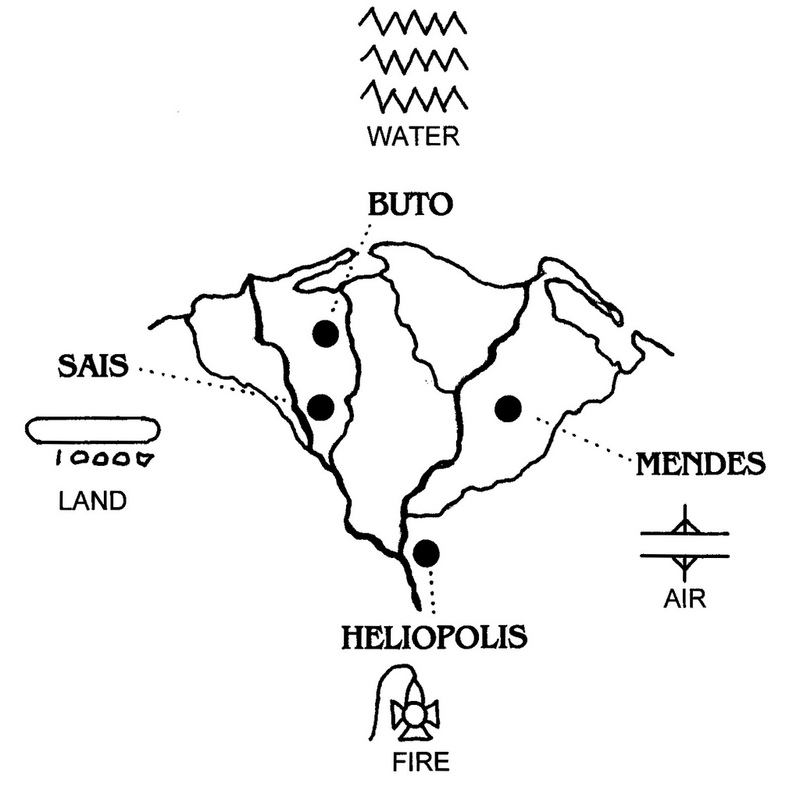 The elements fire (Heliopolis), air (Mendes), earth (Sais) and water (Buto) are, in that view, stages in a four-fold visibility (adapted after Tunnicliffe; DESROCHES-NOBLECOURT, 1963). 1.The city of Heliopolis, just north of Cairo, was known as a place of sun worship. The place acted as a religious centre for a long time with the god Atum (created by itself, the hidden unity) and an entourage of eight gods as a centre point. A modern comparison of this ‘unity’ and a subsequent follow-up would make a comparison with the First Quadrant appropriate. The Enneade of Heliopolis points to nine gods, but there is a distinct distribution, following the numbers 1 – 2 – 2 and 4. The primary godhead (Atum/Ra) gives life to Shu and Tefnut (related to the wind/air). This duo fostered the oppositional pair of Geb (earth) and Nut (heaven). The gods of heaven (mother) and earth (father), in turn, raise four children: Nephthys, Seth, Isis and Osiris. At present, there is only the obelisk of Sesostris I (1972 – 1928 BC) left in Heliopolis as a monument. Another obelisk is transported to the Thames embankment in London and a third to the Central Park in New York. 2. The city of Mendes (Tell el-Rub’a), in the east, was characterized by the two pillars of Osiris, the djed pillars, evoking the concept of air (see also p. 460/461, fig. 377). The god Shu was a ruler over the open sky and the four winds. A modern (quadralectic) interpretation would place this airy element in the Second Quadrant, the place of the first mental (four) division. The remains of the ancient sixteenth nome capital Djedet, which was also called Per-banebdjadet, meaning ‘House of the Ram Lord of Djedet’, became a royal residence and capital in the 29th Dynasty. Its history goes back to the Old Kingdom and even artefacts from the pre-dynastic era were found. The worship of a ram god (Amun-Re) was ancient and found its origin in Khnum, a ram god of the Nile, bringing fertility and a potter god of creation. The ram god was later associated with other gods and grew in strength. The four divine generations, brought together in the four headed ram god – consisting of Re, Shu, Geb and Osiris – were known as Sheft-hat. They were worshiped in a temple of the Late Period, restored by Ptolemy II Philadelphus. 3. Sais (Sa el-Hagar), as the western most city of the quartet, is located on the Bolbitine (Rosetta) Branch of the Nile and the chief city of the fifth Nome of Lower Kemet. Sais, to the west, represented the necropolis where the body was buried and therefore, associated with the element of the earth. A modern interpretation would place this stage of the journey in the Third Quadrant, the most visible in terms of material and its opposite. The city was dedicated in the old days to the creation goddess Neith (Net or Nit), the queen of Lower Egypt. She was represented by a woman carrying bow and arrow and was the mother of the crocodile god Sobek. Neith was addressed as the ‘Opener of the Ways’ and therefore, associated with Anubis. The city reached its heydays when powerful kings from Sais reunified Kemet and started the Saite (26th) Dynasty. Psamtek I (Psammetichus I) became the first king of the reunified country (664 – 610 BC). The cultural achievements of the 26th (Saite) Dynasty are sometimes characterized as a ‘Late Renaissance’, because many of the old styles and customs were reintroduced, but on a more cerebral and intellectual level. It might well be that the four-fold spirit and consciousness were an important element in this late revival of the Egyptian cultural history. That would explain – in hindsight – why so much of this Great Finale of Visibility is lost or dispersed. In this stage of history the knowledge had dawn that the visible visibility (the material track record) was only part of the story of human life. 4. Buto (Tell el-Farien), as the most northern city of the quartet, is situated in a watery environment and renowned for its canal. Buto is also known as the ‘Place of the Throne’. The transformation took place in the aquatic world of the primordial abyss, evoking the water surrounding the unborn child. A modern (quadralectic) interpretation would define this stage as the Fourth Quadrant, being a place in the communication where a (new) insight in the multitude takes place pursuant to a wider form of division thinking. In the old days, the city was home to a cult of the cobra goddess Wadjet (Uatchet or Ouadjyt), who was the partner of Horus. She was also known as ‘Uarchet, Lady of Heaven, mistress of all the gods’. The Greek historian Herodotus mentioned the place as being famous during Persian times for its oracles. The latter custom could be a reference to the four-fold way of thinking, which leaves ample place for a prediction of the future (as also can be seen by the famous oracle of Delphi, enjoying its heydays in the eighth and seventh century BC). The architecture of temples was part of the long and well-documented history of the Egyptian cultural development in which the mental tetradic setting played a role in its own, unpretentious way. The modern, quadralectic interpretation distinguishes a cycle of visibility, starting with the unconscious presence to a realization, followed by a search and ending with a conscious acceptance and appreciation (leading to a new cycle of visibility). This meaningful elucidation of an old way of thinking provides a compliant way of looking at the Egyptian history. The point of view of an early twenty-first-century observer/historian in Western Europe can be put in perspective. It is important to realize that this (subjective) observer is not only watching another culture, but is also part of his or her own cultural development and goes through the same motions as the subject of interest. Recognition is only possible when types of division thinking are in concordance. A ‘simple mind’, rooted in lower division thinking, cannot comprehend and understand the field of insight of a higher division thinker. The certain truth is that only a tetradic mind can fully grasp the tetradic features within the Egyptian cultural history. The various ‘waves’ of interest in other cultures within the European history are marker points for a specific way of understanding. The ‘discoveries’ of the Greek philosophical knowledge in the ‘Twelve Century Renaissance’ and the admiration for the Roman artistic achievements in the Italian Renaissance are ‘moments of truth’ within the cultural history of Europe. The beginning of the Egyptian Revival around the year 1800 has to be added to these important historical data. The Greek revival is the moment when an active, but often latent, four-fold consciousness became visible to the year 1200. This visibility (in particular in the translation of the works of Aristotle) was the demise of four-fold thinking as it existed in the four Scholastic senses or interpretation of the Scriptures. The emphasis was moved towards lower division thinking, offering the rewards of power and material wealth. And, last but not least, a cultural identity. The ‘Italian’ Renaissance (or Roman revival) was the deliberate search for greatness in the material world. The architects and builders in Italy, and gradually in the greater parts of Europe, looked for their inspiration to the spirit of their predecessors at the time of the Pivotal Point in the Roman cultural history (125 BC, see p. 126, fig. 88). And probably they were right: the Roman Empire was at this stage of its development in a similar position as the European cultural period towards 1500 AD: both entities searched for the limits of (visible) visibility and creation. The ‘Egyptian’ cultural interest, finally, started as a ‘third wave’ in the early eighteenth century, most likely with a French book called ‘Sethos’, which was anonymously published in Amsterdam in 1731. Mozart’s masterpiece of the ‘Zauberflöte’ (The Magic Flute), written in 1791, had all the weird zeal for the Egyptian culture transferred into music (VAN DER BERK, 1995). The Egyptian Revival reached its climax after 1800 and gripped the imagination of the creative people in Europe (CARROTT, 1978). The newly found mysticism, fed by (illustrated) descriptions after Napoleon’s campaign in Egypt (1798 – 1801), was easily absorbed into the Romantic movement. Howard Carter’s discovery of the grave of Tutachamon in 1922 sparked a renewed interest in Egypt and its historic meaning. It might well be, that Europe’s entrance in its Fourth Quadrant (1800) provided the under-standing of the old Egyptian wisdom of (tetradic) thinking.